Former police chiefs Godwork Noel (left) and Jacky Nau (right). 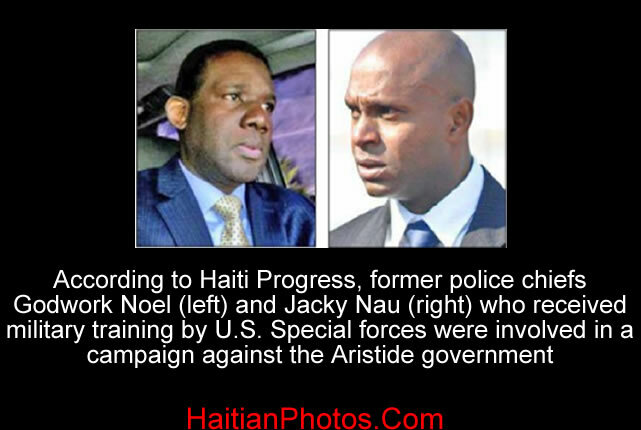 Based on information obtained from the weekly newspaper Haiti Progress, in the United States, these two were involved in a campaign against the democratic movement in Haiti. The report stated that both Godwork Noel and Jacky Nau received military training by U.S. Special Forces. In October eleven senior police commanders tried to stage a coup D'etat agains the Haitian government; however, the plot was uncovered and officers fled to Ecuador and the Dominican Republic. Those who fled to DR include: Guy Philipe, Mesilor Lemais, Seide Didier, Dormel Jacques Patrick, Fritz Gaspar and Noel Godwork. The Haitian government formally requested the repatriation of six of the police Officers who had fled to the the Dominican Republic, accusing them of conspiring to overthrow the government. The repatriation did not take place.